The freshman scored a record 40 points in a key Big East victory over UConn. 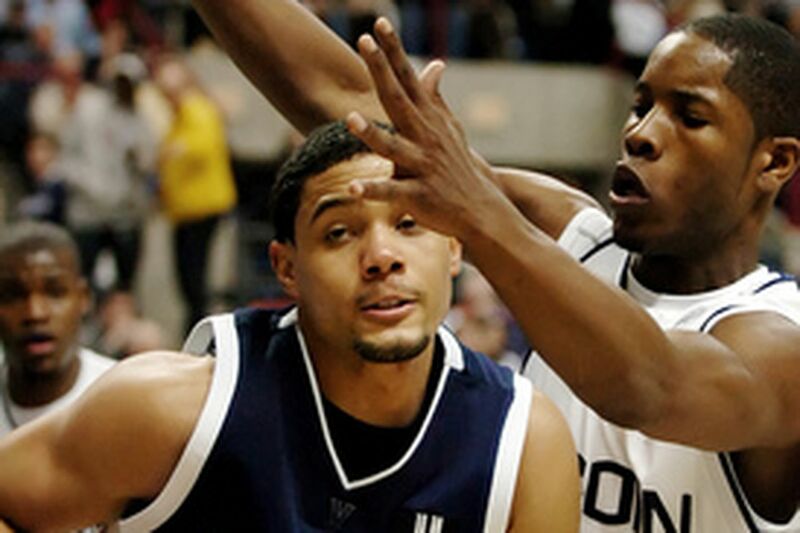 Villanova guard Scottie Reynolds moves around UConn's Jerome Dyson during the first half. Reynolds' 40 points - more than half of the team's total - broke a freshman school record set in 1978. But his fouling out, he said after the game, encouraged by coach Jay Wright, was "kind of stupid." STORRS, Conn. - Scottie Reynolds was busy setting scoring records and helping Villanova make its case for an NCAA tournament bid last night with a frantic 78-74 win at Connecticut, but afterward the first play he mentioned was one he described in a single word. It was not brilliant, the word on everyone else's mind. The Wildcats guard scored 40 points - more than half of Villanova's total - to break the Villanova freshman scoring record of 35 points set in February 1978 by Alex Bradley. "Stat-wise it looks pretty good, but I did some things that me and Coach know . . .," Reynolds said. "Say it, Scottie," coach Jay Wright interrupted. "That was kind of stupid," Reynolds finished with an embarrassed grin. They were referring to Reynolds' fifth foul with 41 seconds remaining, when Villanova (20-9 overall, 8-7 Big East Conference) was up by 71-65 over Connecticut (17-12, 6-9). Reynolds sweated it out on the bench while his teammates gutted it out on the court to record a significant 20th win that will make it tougher for the selection committee to shut out the Wildcats. "I was just hoping that we won, because if we didn't, he was going to be all up in me after the game," Reynolds said about his coach. Wright is one of the last coaches who would publicly blast a player - especially one who just came one point shy of tying the Big East freshman scoring record set by Seton Hall's Marco Lokar in 1990. The player and coach have a special relationship, with the right balance of tenderness and toughness, in which Reynolds has thrived. "He's always there and correcting me for the best," Reynolds said. "I thank him for it, not babying me and telling me when I'm wrong." His point total was the most ever scored by a Connecticut opponent in Gampel Pavilion and the most by the Wildcats since Kerry Kittles put up 44 points in February 1995. It was enough that Connecticut coach Jim Calhoun nearly toasted Reynolds afterward. "I just saw the rookie of the year," Calhoun said. While Reynolds looked smooth shooting 12 for 25 from the floor, including 6 of 15 three-pointers, the game was hardly bump-free, and Reynolds needed assistance. Forward Curtis Sumpter did not win points for flash, but he came up big with 18 points and 10 rebounds. "That's a senior," Wright said. After the Huskies closed to within a point, 65-64, with 2 minutes, 27 seconds remaining, Sumpter came up with perhaps the biggest play of the game with a put-back of a three-point miss by Reynolds for a 67-64 'Nova lead. On the next possession, he tipped a Connecticut missed jump shot to Mike Nardi, who fed the ball to Reynolds. Reynolds went one-on-one with Connecticut's 7-foot-3 center, Hasheem Thabeet, to score on a reverse layup, while he said he was thinking, "Don't get hit." Villanova found itself in trouble, with Reynolds, Dante Cunningham and Will Sheridan fouling out and Sumpter, Nardi and Shane Clark picking up four fouls apiece. The Huskies were able to connect on some foul shots down the stretch, but for most of the game they had as many solid free-throw shooters as Storrs has five-star restaurants. Connecticut, which appears to be headed for the NIT, made just 24 of 44 free throws while Villanova made key shots at the line to preserve the lead. Wright said he actually was rooting for the Huskies to make their free throws to eliminate three-point plays. Connecticut dominated the offensive boards with 25. "I think that's what won the game for us - we didn't give up," Sumpter said. Wright even slipped in a compliment for Reynolds, who has scored more than 20 points in the Wildcats' last four games. "I was really impressed," Wright said. "He's done it in big arenas. He's done it in big games."